Emma Woodhouse has it all – beauty, brains, breeding and bucks. She considers it her highest achievement to have successfully played matchmaker for her governess, seeing her happily settled nearby. But when chooses Harriet Smith as her next matchmaking target, she unwittingly builds a house of cards for Harriet and herself. 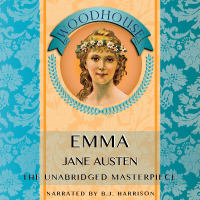 In one of Jane Austen’s most beloved novels, Emma explores the vagaries of class, the foibles of matchmaking, and the merits of true character.